Giants Packers playoffs: Why, oh why, did Green Bay have to lose? Why, oh why, did the Packers have to lose? 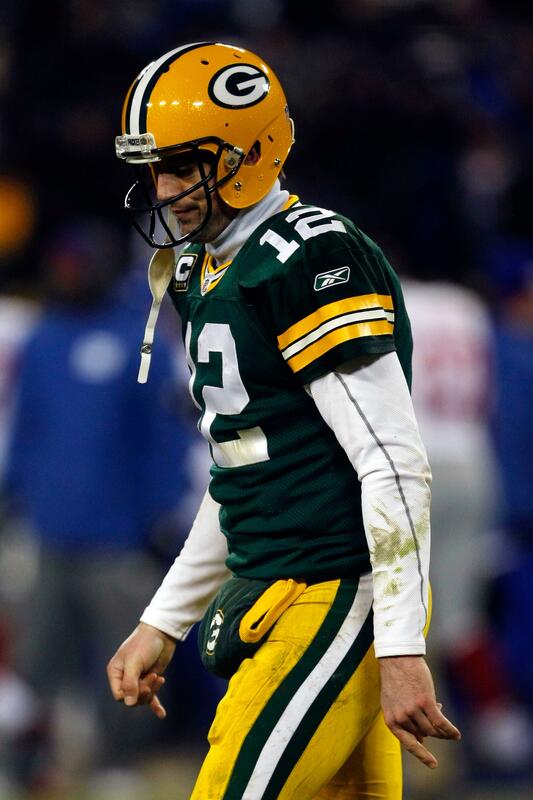 Aaron Rodgers looks on dejectedly as the Packers lose to the Giants. Photo by Scott Boehm/Getty Images. Well, let’s hear it for the rabid talk-radio maniacs of New York, who pretty much had this one pegged. The Giants outplayed the Packers on Sunday evening—or rather, the Giants played a fairly decent game and the Packers coated their hands in butter before kickoff. On top of the three official fumbles the Packers coughed up, there was of course Greg Jennings’ phantom fumble in the first half, inexplicably not called and then even more inexplicably not overturned on review. Had the Packers won, the victory would have been accompanied by a big asterisk. Thankfully for posterity, if not for my mood last night, the game wasn’t ever really close, even when it was close. The Giants look more and more like this year’s version of last year’s Packers: hot at the right time, tough on defense, winning on the road. I tip my cap to Tom Coughlin, that ruddy-faced imp who seems to be neither a particularly skilled game manager nor a great innovator but who excels at getting the most out of a team when everyone else has given up on them. I hope Coughlin and Chris Snee share a laugh over the breakfast table tomorrow morning while their wives roll their eyes. That’s what happens in the sitcom in my head, The Fightin’ Coughlins. Tonight, the Packers got to show America once and for all that they have one of the all-time worst defenses in the history of the National Football League. That amazing sequence at the end of the first half, with the Giants out of timeouts—Packers call timeout, Packers let Ahmad Bradshaw get out of bounds after 23-yard run, Packers give up absurd Hail Mary—was maddening to watch. But gratifying, I think, to fans who have had just about enough of the Discount Double Check and would like to knock that smirk off Aaron Rodgers’ face. This week, anyway, I didn’t see Rodgers yawn once. He didn’t even look particularly cocky. He just looked sad and confused at his receivers’ inability to catch the ball, his own inability to hit those receivers, and (most of all) the Packers defense’s inability to tackle, cover, rush the passer, or perform any of the other tasks usually associated with defense. The Packers gave up almost 300 yards passing in the first half, about the same as their full-game average for the season—the worst average in NFL history, by the way. Josh, your Saints went down hard, but unlike my team, at least they went down fighting. Do you feel worse than me? And Dan, congratulations for your team’s berth in the NFC Championship Game! Or at least one of your teams, you freak.